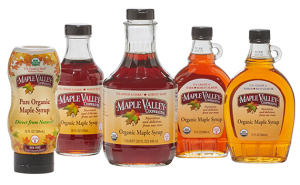 Maple Valley’s mission is to produce and market the finest organic maple syrup products with fair and sustainable methods while respecting our farmers, our customers, our vendors, our employees, the environment, and our communities. Maple Valley, a pioneer in organic and fair practices for maple production, was founded in 1991, became a cooperative in 2007, and continues to produce 100% pure and organically produced maple products year after year. As a cooperative, we offer you a high-quality certified organic product free of additives, preservatives, and formaldehyde – and moreover, we bring you a socially responsible commodity. Great effort has gone into selecting responsible, organically certified woodland farmers whose standards and practices represent stewardship to the environment and our planet. Our main processing plant and offices are in Cashton, Wisconsin. Our farmer base encompasses the Great Lakes and the Appalachian region of the United States. We believe in family scale farming, fair wages for producers and employees, transparency, accountability, and sustainable fair business practices. The only way for us to be in business is to offer you QUALITY. We do this by selecting those maple producers who pay great attention to the fine science of making maple syrup. When Mother Nature says it’s time to let the sap flow, a producer may spend weeks non-stop collecting, dumping, filtering and boiling the sap, measuring brix (sugar) content, rotating pans, checking and double checking temperature, draining off different grades, cleaning equipment, packaging syrup into containers, and many other tasks! The result for you is a very high value product that we feel deserves a fair price for both the producer and the user! Maple Valley considers every maple farmer and maple cooperative member we do business with as an important alliance and takes our pledge to give a sustainable pay price to our farmers very seriously. Every year we meet with our maple cooperative members and individual farmers to determine a fair price. Because of this close relationship with our farmers, we are able to create high standards of quality and consistency. We hope you appreciate them as much as we do! Farmer-Owned. Fair Trade. Organic. And a Cooperative! In 2007 the founders of Maple Valley created a co-op with five classes of membership: Producers, Customers, Investors, Vendors, and Employees. The Organic Maple Cooperative was designed to represent all of our stakeholders as a way to leverage the strength of our producer base, our outstanding employee knowledge, and our strong customer following, and to represent investors who believe in cooperatives as a socially responsible investment vehicle. In our co-op, producers are the dominant stakeholders, with customers, producers, investors, vendors, and employees each having a representative on the board. Our seven member board consists of four directors elected by producers and one director elected from each of the customer and investor, producer, vendor, and employee groups. Our producer base encompasses Wisconsin, the Great Lakes, and the Appalachian regions of the U.S. Our central processing, warehousing and offices are based in Cashton, Wisconsin.